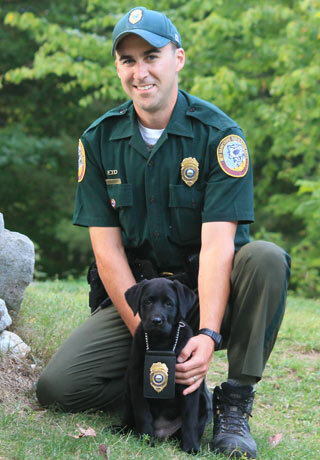 New Hampshire Fish and Game Conservation Officers have the challenging job of protecting and investigating the illegal taking of all fish and wildlife in the state. They also are responsible for conducting wilderness search and rescue missions. They respond to and investigate all levels of criminal violations. You can help support this essential unit by sending a donation to the Wildlife Heritage Foundation of NH – Canine Fund, PO Box 3993, Concord, NH 03302 -- or give online. Conservation Canines or "K-9s" are a unique tool to assist Fish and Game Law Enforcement in their investigations, apprehension of violators, and conducting search and rescue missions. Conservation Officers work with their canine partners conducting tracks, area searches, evidence detection, fish and wildlife detection, and search and rescue activities. Select a tab to see photos and learn more about our Conservation Canines. Moxie joined the Fish and Game team in 2017; she patrols with CO Eric Fluette. 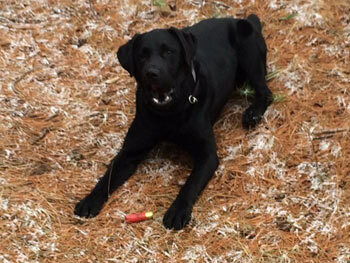 Moxie was donated to the Department by Wes and Bel Reed of Rise and Shine Retrievers in Barnstead, NH. 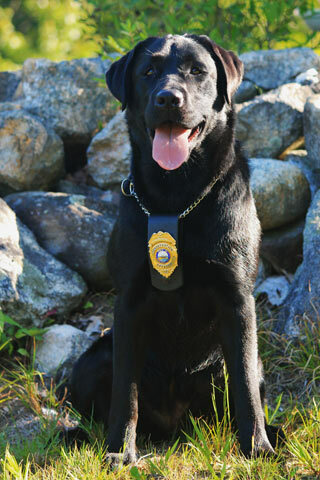 This is the second Labrador Retriever donated to the department by Rise and Shine Retrievers (K9 Cora was donated first). Photo of Cora in August 2017. Select image for larger view. Ruby joined the Fish and Game team in 2012; she patrols with CO Bill Boudreau. 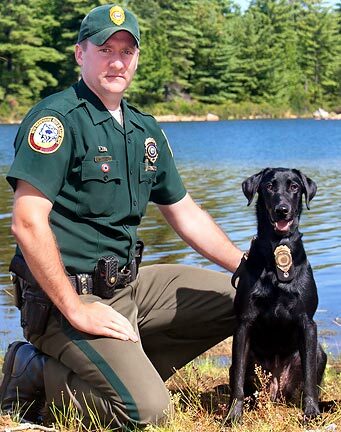 December 15, 2015: It is with great sadness that we announce the passing and End of Watch for K9 Poacher of the NH Fish & Game - Law Enforcement Division. 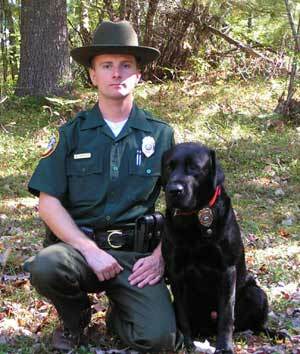 Poacher was the first certified canine with the Department and served from 2002 - 2010 with his handler, CO Mark Hensel. 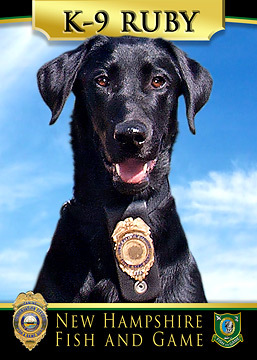 Poacher was a great tracking dog and participated in numerous search & rescue missions locating several missing people. Poacher made numerous law enforcement cases by locating evidence in the illegal taking of deer, fish and other crimes. Poacher also worked several investigations assisting other agencies by tracking suspects in a bank robbery, home invasion, car theft and homicide investigations. After his retirement, Poacher spent several years with his handler and best friend swimming and 'diving for rocks.' Injuries sustained during his career finally took its toll on Poacher. Poacher passed peacefully with his handler by his side. He lived a long and joyful life and will be sorely missed. The criminal justice system requires all Law Enforcement canines to be highly trained and certified in their respective fields of expertise. 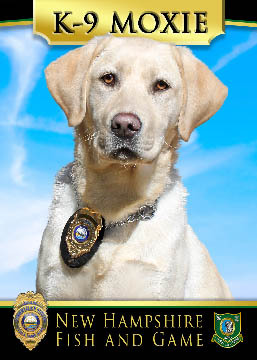 Law Enforcement canines must also be highly trained and certified to be able to hold weight in a criminal trial. 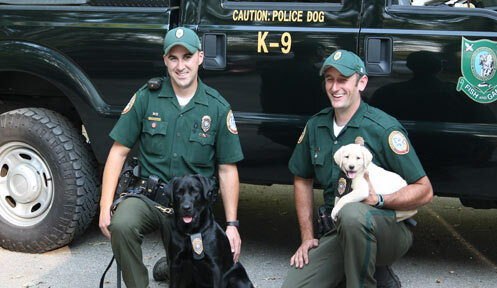 Conservation Officers and their canines are certified through the United States Police Canine Association (USPCA). Their certifications include tracking, evidence detection, agility and obedience and fish & wildlife detection. Training is very intensive and conducted on regular basis to maintain an extremely high level of proficiency and reliability. The Fish and Game Department estimates the yearly costs of a canine to be approximately $2,000. This accounts for food, veterinary bills, and general wellness and disease prevention. (But not unforeseen emergency medical conditions, which can drastically increase costs.) 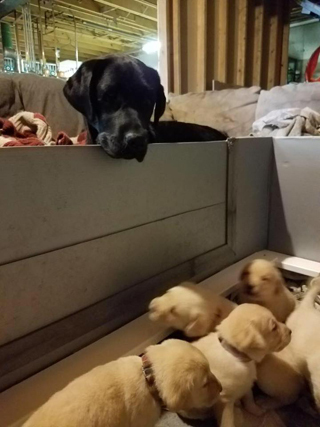 Whatever the cost to keep a Conservation Canine healthy and on the job, it's an inexpensive price to pay to have a highly trained and competent canine team coming to look for your lost love one, or help catch the criminals and those who decide to violate our fish and wildlife laws. 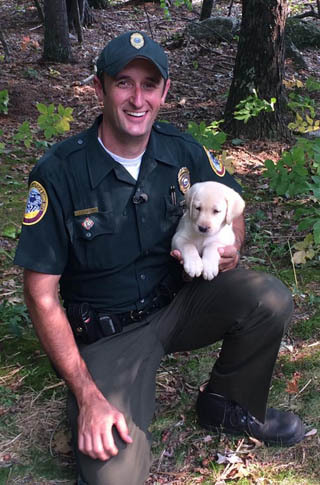 In fact, there is little argument that canines are some of the most cost-effective tools used by Law Enforcement and Conservation Officers.